- Chestnut honey is rich in minerals, fructose and glucose. - Ingredients: 92% chestnut honey*, 8% fresh polyfloral pollen*. - 21 day course: take ½ teaspoon morning and evening before meals. Melt under the tongue before swallowing. - Skin: Apply a thin 3mm layer to body, face, or nails. Leave for at least 15 minutes. Rinse. - Hair: Mix ½ teaspoon in ½ glass of water. Apply to hair and massage in. Rinse. 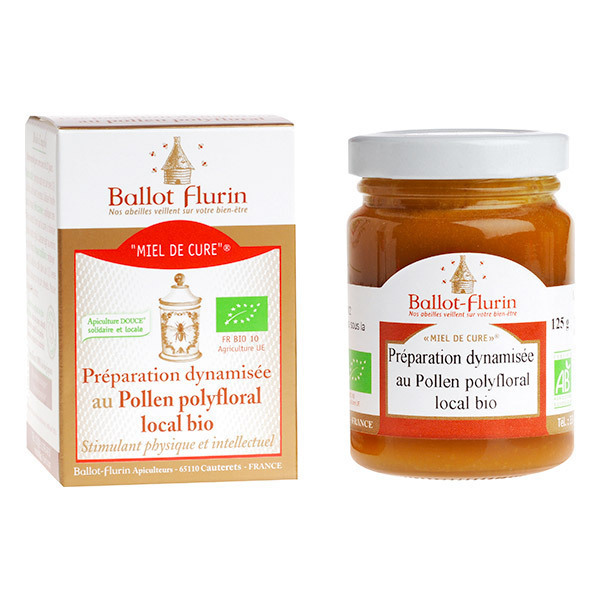 Natural health expert and pioneer of organic products, Ballot-Flurin has created a line of natural products containing propolis, royal jelly and other benefits from the hive! Ballot-Flurin products are created in the South West, in the Pyrenees, a countryside full of happy bees. Ballot-Flurin's efficient preparation process comes from three generations in alternative medicine and from the love and understanding of bees: the raw materials are produced and prepared on site with real beekeepers living in the countryside. The precious potentised ingredients are carefully packaged and cared for until reach the customer thanks to well developed home-made manufacturing methods based on low-tech manual and non-polluting processes.